also dug up my old Polo high school bag, just gave it a good cleaning. good as new. almost. 'Was in Greenhills this afternoon to pick up a few things. While I was lining up at the atm machine, I sensed a commotion on the floor above me. After a few seconds, I saw a guy rush down the stairs and go past me. Running after him was a gang of muslims shouting and screaming. After them a huge pack of policemen soon followed. The floor of the platform started shaking violently and we got bumped by some plain clothes law enforcement people. It was quite scary only to realize after a minutes that he was just a shoplifter. I guess all those guards stationed at the doors to check bags are bored out of their wits and die for some sort of action to release them from the monotony of their daily routine. Pity about the shoplifter though, I heard he was beaten up by the guards and muslims. He was such a scrawny little man, kind of a pity too. They should've just billed and booked him. your top and pants really matches!! Great stripes! And you look fantastic in that hat. woah, poor guy! i wonder what he stole? if it were just some petty clothes/shoes... then those guards overreacted!!! Aww... You're right. They should've just made him pay like twice or three times the amount. Beating him up was uncalled for. But I guess that's what you get for stealing. But when I saw the Anagon haul you did, I said I was excited to see how you'd style the accessories. Now that I see this, I never would've even thought to wear those three things at the same time! I super love your trousers!! huhu I've been waiting for something like that and now it's haunting me! Such a cool outfit, you always look so effortlessly stylish! Hey! u have a lovely blog! Im totally following your blog now! follow me back? 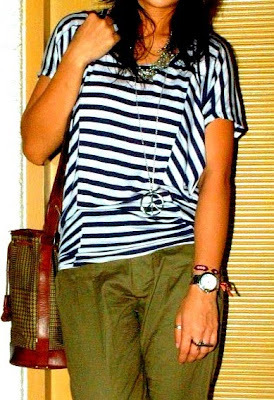 i definetely love your style:)like stripes and army trousers! Follow me dear? ?i'd be very happy if you do it! Love your trousers! 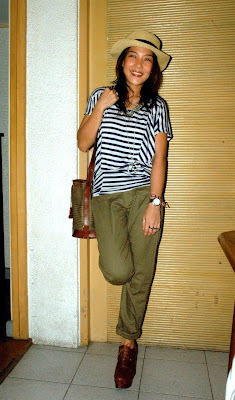 I wish I could pull off that look but I have huge legs right now and I´m petite. lol! @dressing up for me: LOL, still hold my bag close to my body to this day. lost 2 wallets there already through the years! Hey! good to see you are well and SHOPPING :) Hahaha! That is a cute outfit! Thank you for your sweet comment on my blog. Are you pinay? I am Filipino. Thanks for visiting my blog today! Love your outfit!! love your shoes! i would never have thought to put them with that outfit, but it looks great! great outfit ! love it all over. I love your outfit .. shoes are amazing ! Love that hat! Darling outfit!